Black Friday, Cyber Monday? Try charitable Tuesday Instead! The black Friday and cyber Monday spending frenzy continues. It is projected that consumer spending on both days will continue to grow over 45% each year. That is an average of $743 for a family, that amount is up from $505 last year. The retail industry loves this so called “holyday tradition”, because they can get over $700 in a day or two, from a hard-working family that might take several weeks (sometimes months) to save that money. Here at Saving For Hope, we encourage people to save money with a purpose. For your family, that purpose might be going to a retail store and spending your hard-earned cash on electronics, gadgets, and clothes. That is ok, if you are budgeting for it (check out our article about budgeting here). What is not ok is when families go and spend their cash on “deals” that they might not need, they might not have the money for or that they might take money from groceries to get more stuff. This is exactly the kind of behavior that we despise here, and that we try to break from kids, and young adults and families. Of course, we are not saying don’t buy things, what we are saying is that there seems to be something wrong when families are spending over $700 in a few days, but the same families might not have the same amount of money on a savings account for a rainy day. Have you heard people say to you, or have you said after the holidays: “I am so broke” or “that was an expensive _______ (insert the holiday)? If so, here are a few tips so you can survive the “broke Tuesday” and plan better for the future. Prioritize what you truly need or want: It is ok to want stuff (toys or gadgets) to enjoy, at the end of the day there is only one life to enjoy. But be careful from falling into the “I want more” syndrome. Have priorities, look for the things that you might be able to enjoy with your family, or things, that might fit with hobbies and interests that you already have. Plan ahead: If you are going to spend that amount of cash in purchases, plan ahead. Budget for the items you want to purchase, and stick to your plan. Do not buy stuff out of just impulse. This will save you cash in the end. Don’t go over your budget: Even if you see the latest video game on sale for half off, if it wasn’t on your list, don’t buy it. Stick to your priorities and don’t fall into the frenzy. Retail stores love to trick people into thinking that they are giving you a great deal. Don’t believe us? Check out this article from our friends at lifehack.org that shows tricks retail stores use to make you spend more money. 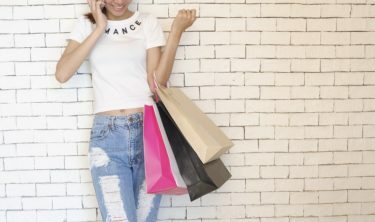 Shop alone: Statistics show that if you shop with people you are more likely to spend more money that if you are alone. People that shop with kids spend about 29% more and people that shop with their significant other spend about 19% more. Don’t linger in the stores: The more time you spend inside the store, the more money will you spend. If you are shopping online, don’t browse too long on such sites looking for items, if you do, you are more likely to buy it. Remember what we always highlight on this blog, be content and build a legacy to help others. At the end of the day, it is not about accumulating wealth, or saving just to have stuff. It is about having purpose, serving people, taking care of creation, breaking poverty cycles, and giving back to each one of our communities. All financial choices you make in your lifetime will have real consequences in the future, for you and your love ones. Imagine if people instead of spending over $700 on stuff they don’t need, they will donate half of that money during the holidays to a worthy cause, or to a non-profit organization to help people? That will be a total of over $4 billion going to charities on one weekend. Imagine that for a minute!! And what about if you save half of that money for a rainy day, instead of buying another TV that you might not need? Of course, we are not going to ask you to spend half of your cash on charities, but what about 10%? Let’s make giving Tuesday a new trend! The bible says: “only a fool doesn’t plan ahead, and even brags about it” (Proverbs: 13:16). Please, this holiday season, don’t be a fool, don’t over spend money and instead with a sincere heart try to help people, as an alternative of falling into the spending frenzy. But most important of all, with your love ones during the holidays, Enjoy! ← To credit or not to credit? That is the question.